Joseph "Joe" Cada (born November 18, 1987) is an American professional poker player from Shelby Charter Township, Michigan, best known as the winner of the Main Event at the 2009 World Series of Poker (WSOP). Cada became a representative of Team PokerStars in 2009 in the weeks prior to becoming World Champion. By winning the Main Event at the age of 21, Cada surpassed Peter Eastgate as the youngest champion ever. 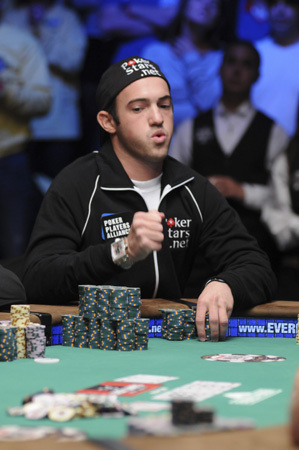 Cada had two previous WSOP cash wins, both in 2009. Cada had been a regular online poker player for several years prior to winning the live WSOP event. He is primarily an online poker player, with more than $500,000 in online tournament winnings at present. At the 2009 World Series of Poker he had three in the money finishes (all in No limit Texas hold 'em): 64th in the 1,088-entrant June 5–7 Event 13, $2,500 No Limit Hold'em, which earned him $6,681; 17th in the 2,095-entrant June 16–18 Event 35, $1,500 No Limit Hold'em, which earned him $21,533; and 1st in the 6,494-entrant July 3–15, November 7 and November 9 Event 57 $10,000 World Championship No Limit Hold'em, which earned him $8,546,435. Prior to his final table victory, Cada earned a $1 million contract with PokerStars that pays for all his hotels, travels, and some of his buy-ins. His signing with Pokerstars resulted from an interview on ESPN with Phil Gordon where he expressed an interest in signing with that specific company. His agent had already procured him offers from UltimateBet and PokerHost as a result of his November Nine qualification. Cada was represented by agent Dan Frank. In the main event, Cada was the tournament chip leader after day 1C, which was the third of the four opening day sessions, but he began the final table with the fifth largest chipstack. In the 122nd final table hand Cada's stack was reduced to 2,275,000—enough for only four big blinds and about 1.2% of the combined total stack at play—due to calling Jeff Shulman's "all in" pre-flop with A♦ J♣ against A♣ K♥. No community cards hit either player, and Shulman was rewarded by his better high card. Cada went all in pre flop and was dominated on two occasions, once with pocket threes vs. pocket jacks and the other with pocket two vs, pocket queens. Both times, Cada flopped the winning three of a kind. Cada was able to recover and by the time the field was reduced to two players he had 135 million chips to 58 million for Darvin Moon. During the final heads-up duel, Cada surrendered the chip lead, but he eventually climbed back to 120.1 million before the last hand of the heads-up with Moon. He regained the chip lead on the 80th hand. His winning hand was 9♣ 9♦, which he got all-in pre-flop against Moon's Q♦ J♦. The board ran 8♣ 2♣ 7♠ K♥ 7♣. This hand was the 88th hand of heads-up play between Cada and Moon. These three events account for his total cumulative career live event earnings of over $8.5 million. 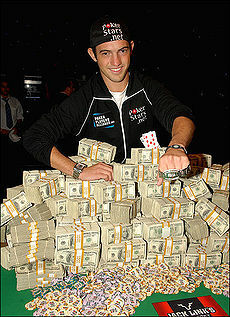 With the November 2009 victory, which occurred just over a week before his 22nd birthday, Cada supplanted Peter Eastgate, who won at age 22, as the youngest World Series of Poker Main Event champion. He was 340 days younger than Eastgate had been at the time of becoming world champion. In the week following the WSOP win, Cada made numerous publicity appearances as a poker ambassador. His media events included appearances on CNN, CBS News, CNBC, Late Show With David Letterman, numerous ESPN outlets including First Take, The Scott Van Pelt Show, ESPNU, ESPNEWS, ESPN Inside Deal and ESPN.com as well as a taping for SportsCenter that was never aired plus a visit to WWE RAW. During the publicity run, Dennis Phillips served as Cada's advisor. As of 2010, his total live tournament winnings exceed $8,626,706.